The 901CL Mechanical flow meter has a large easy to read display, flow ports can be positioned vertically or horizontally, UL/cUL listed, handles fluid of any viscosity, rated for Gasoline, Diesel, Kerosene, mineral spirits, Stoddard solvents and heptane. Fill-Rite meters provide precision and durability in a cost-effective design. 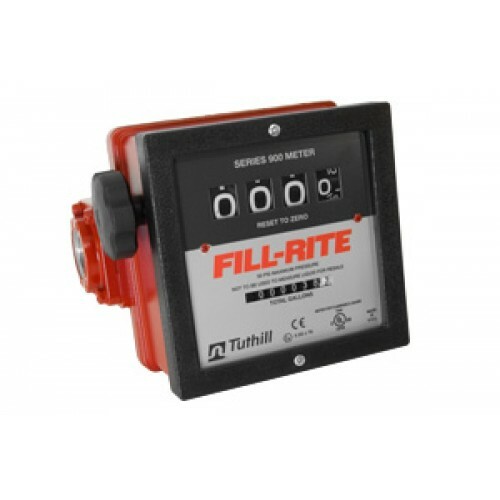 The 901CL meter is a 4 wheel mechanical meter designed for transfer pumps with a flow rate of 23 to 151 LPM. this meter has a 1 inlet and outlet.